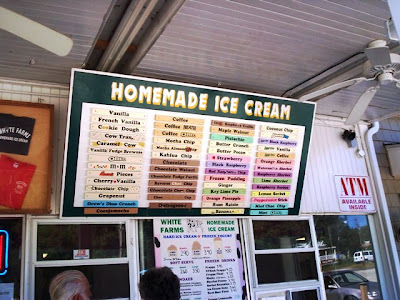 After pigging out on seafood at Clam Box, Mom and I decided to visit another Ipswich hot spot that was just down the road called White Farms Homemade Ice Cream. 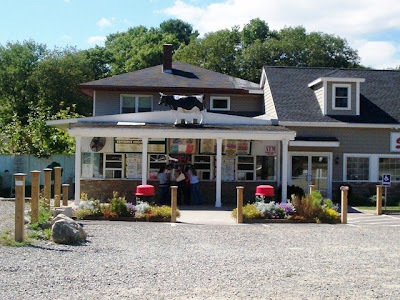 This small shop with a cow on top has also been mentioned on various Web sites and received rave reviews from all who've had a scoop of their homemade ice cream. Not wanting to pass up an ice cream opportunity, Mom and I pulled into the gravel parking lot at just around 1:30 p.m. Yes, I know we had just eaten, but when are we going to be in Ipswich again? Although we were full, Mom and I wanted to have a taste of what people were writing about. Plus, we were on vacation. Anything goes, right? 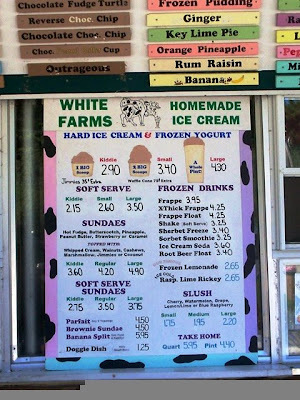 When we walked up to the window, there were two large signs that listed the many flavors and dessert options that White Farms offered. A group of giggling teenagers were at one window getting ice cream. We noticed that a few girls were getting kiddie size cups, and when we saw how big those cups were, Mom and I decided that we would also choose the kiddie size. It was huge! 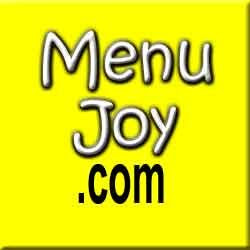 When it was our turn to order, I asked the girl behind the counter a question. There was a flavor on the list called "outrageous," so I asked her what it was. She said that it was a double chocolate ice cream with chocolate chips, a chocolate swirl, and a homemade brownie mixed in. SIGN ME UP! I ordered a kiddie cup of outrageous ($2.90) while Mom ordered a kiddie cup of cocojamocha ($2.90). The total came to $5.80. 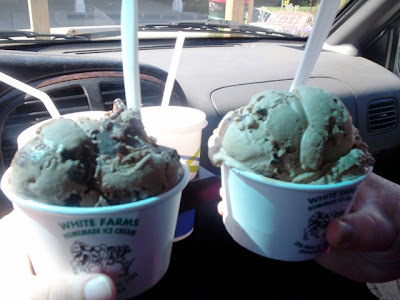 When our ice creams were ready, Mom and I took them to the car so we could chow down. We could have eaten in the small grassy area at the side of the building, but it was a bit chilly outside. After snapping a pic of the cups, we dug in. Mom's cocojamocha was delicious. She said it was like a cross between rich coffee and chocolate flavored ice creams. It had a deep flavor and was surprisingly sprinkled with coconut shavings, which gave it an extra kick. Mom said that it was a very different taste, and she enjoyed it tremendously. My outrageous was - brace yourselves - outrageous. Surprised? I was! It was one of the best flavors of ice cream I've ever had. There was a homemade brownie mixed into the double chocolate ice cream. The chocolate chips were almost like chocolate shavings, which was great because we all know how hard thick chocolate pieces can get when they're inside of an ice cream. I adored this flavor and I think that any and all chocolate lovers should walk ... no, run ... to White Farms and try a cup of outrageous. It will blow your mind! I've been thinking about it ever since. Too bad it's all the way in Ipswich. 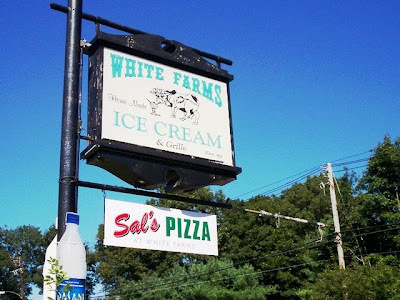 White Farms offers a multitude of hard and soft serve flavors, yogurts, and sugar free ice creams. The prices are average, but they definitely give you your money's worth because the sizes are quite large. I don't know how long White Farms has been in business, but they must have quite a fan base because there are t-shirts sold at the stand bearing the White Farms name. I was tempted to get one, but I don't think a "woman of size" would look good wearing a shirt with a restaurant logo on it. 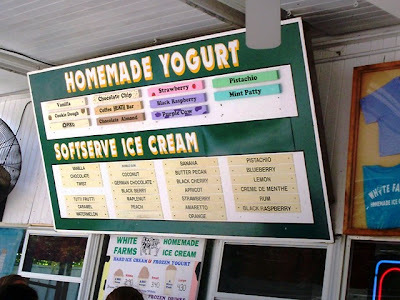 Boy, Ipswich certainly has some fantastic places to eat, and White Farms Ice Cream is certainly one of them. We only wish that they were closer. Perhaps they can pull a "Ben & Jerry's" and start making their ice cream in pints and of course, selling them in Fall River, MA. What do you say, White Farms? We could do with a pint of outrageous down here!!! 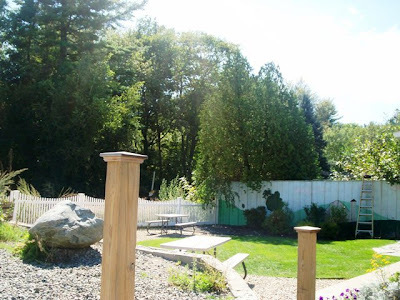 The White Farms Homemade Ice Cream fall hours are from 11:30 a.m. to 5 p.m. daily.